Cancún was my last place to stay and visit on the American soil. This Monday, after 6 months of travelling, I finally got back to Europe (Madrid, Spain to be exact). I almost forgot how it is to live in Europe – I missed it so much;). 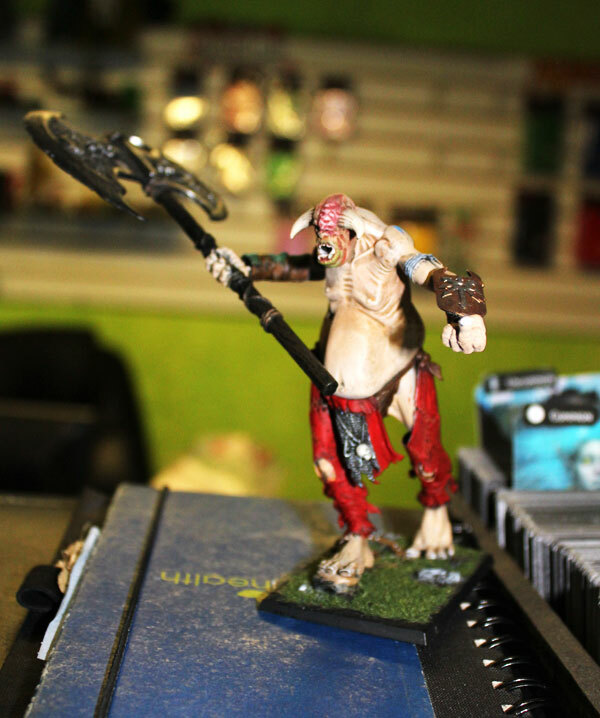 I already visited two stores here in Madrid, but before I give my insight from Spain, I’m going to write little bit about Cancún‘s only hobby store – Gamers Den and little wargaming community there. I’ve visited Gamers Den last weekend with high expectations. First – I was super exited about meeting gamers from there. I turned out, it’s hard for me to stay outside community for longer period of time. 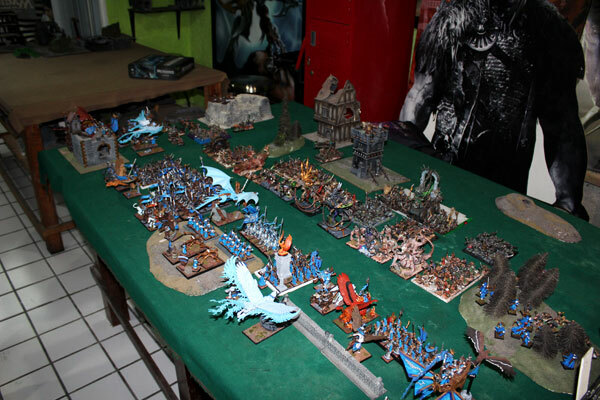 Of course, if there’s no perspective on the horizon – no shops or clubs around – I do not suffer hard, but when I found out that in Cancún there’s a gaming club of Warhammer Fantasy, the anticipation was hard to handle. Second thing. I was hoping to buy new paints (my Kislev Flesh was disaster! I’ve been watering it few times already, and that hasn’t helped at all), and maybe some souvenir miniatures – the best souvenirs possible – for myself:). 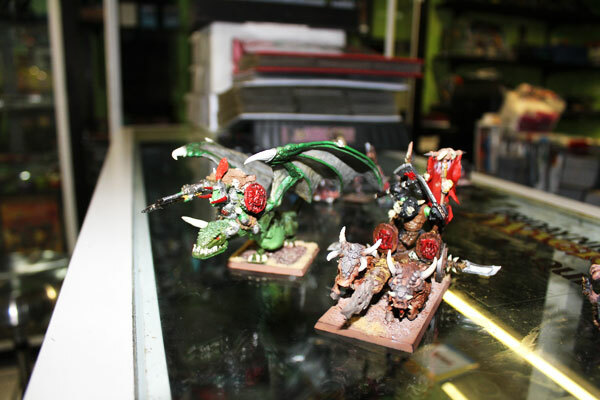 First point turned out great – I met few players from local Warhammer Fantasy Battle Club, I had nice chat with Pedro, the owner of the store, and I was able to take lots of photos of the store. Pedro, owner of Gamers Den. Miniatures offer is minimal. Card are more popular here. Gamers Den has 13 years now. It’s the only hobby centre in Cancún. It might be not huge and populated city, but there lots of players of miniature and collectible card games. So basicly, the offer is responding exactly the demand. There are lots of cards to buy. Beside that, comic books and just few boxes of minis I’ve mentioned before. 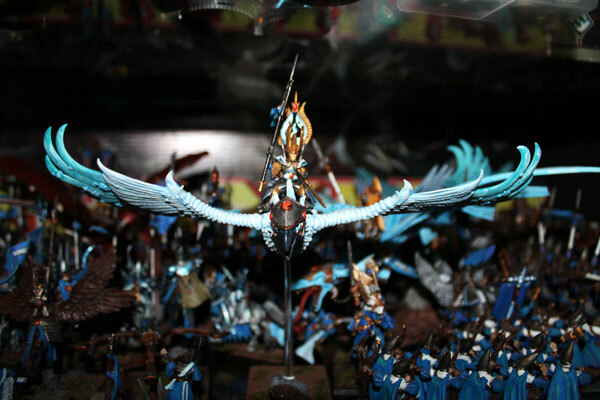 I was told few years ago, Gamers Den had more miniatures and wargaming stuff for sell – but they decided to concentrate more on orders on demand. So, if someone has spotted something on internet, Gamers Den will be more than happy to order it. I know for gamers in Europe or United States, this could be hard to understand. Why not to order by your own? There’s lots of online stores. Well, in Mexico Paypal and credit cards are not in common use. Don’t know even why, they are available in Mexico after all. But when I think, I few of my friends in Poland they don’t like to use Ebay or foreign online stores with some level of distrust – I can say: it’s understandable. The other thing is the matter of support the local gaming shop – giving the shop opportunity to earn some money. Good cause. In the store there are few tables for playing cards. In fact, during my visit,almost all of them was taken. Card gamers were crowding inside and outside the store. Saturday evening and there was about two dozens of people. Nice. Card games are more definitely popular in Cancún than miniatures. Generally, no wonder – cards are cheaper, no transportation difficulties and quicker to set up and play (but they are no minis – so not for me:). CCG players crowd. Mostly Magic: The Gathering. 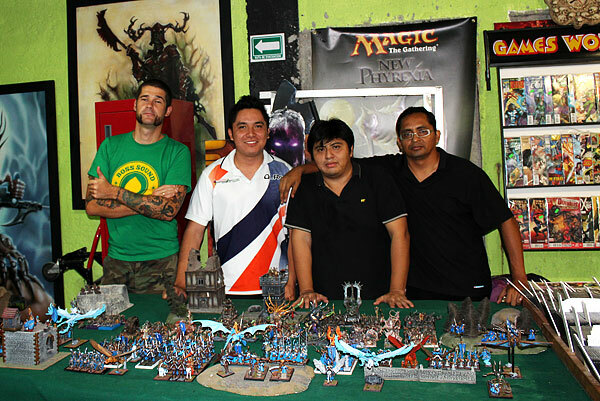 As for wargaming miniature business – in Cancún people play mostly Warhammer Fantasy, Warhammer 40k, X-wing and Heroclix. 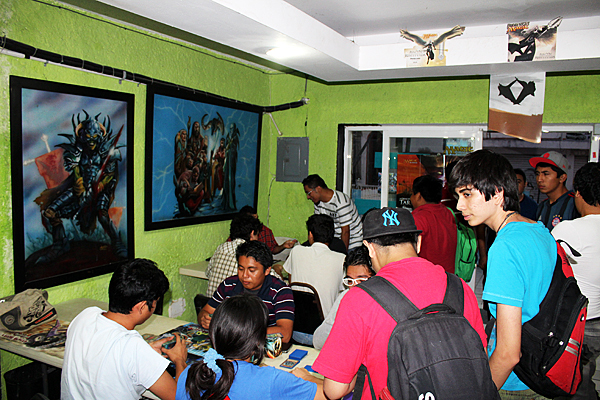 Of course GW games are most popular – there are about 10 players in Cancún area playing WHFB or WH40k. There was 20 few years ago, but it happened the same thing like in every country – lads got older, and eventually gave up on their hobby. 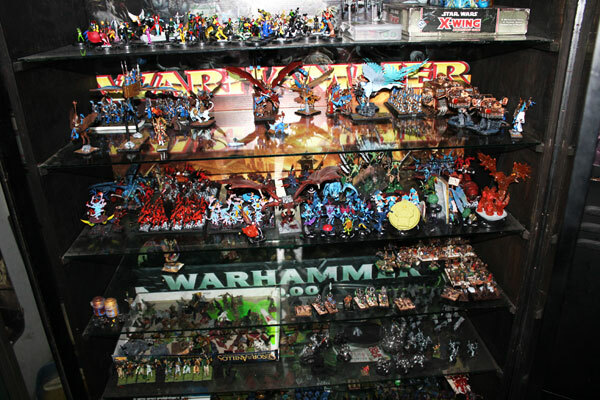 This cabinet holds lots of miniatures for WHFB, WH40k, Heroclix and X-xing. In the store there are two tables with scenery ready for play. In cabinet there are few armies stored by many players. Kind of good idea – if you have a trust to the owner of the store – you don’t have to cart your collection every time you want to play. Permanent storage in the local. Good solution. On the shelf I’ve noticed: Skavens, High Elves, Daemons, Lizardmen, Eldars, Space Marines, some minis from Heroclix and X-wing. 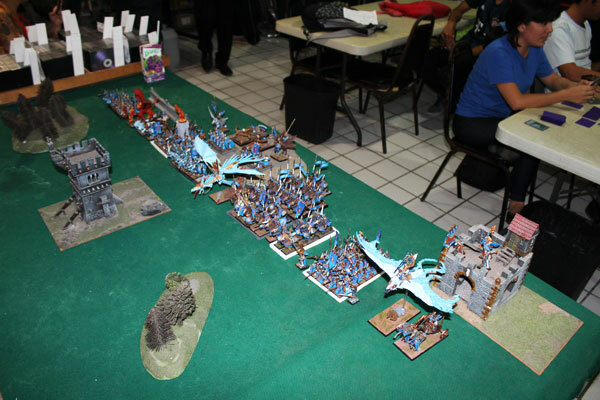 I had the opportunity to chat with some gamers from local Warhammer Fantasy Club. There are 10 Fantasy players in Cancún but no regular meetings – back in the days there was at least one game a week – and now the battles are not played that often – few meetings in the months. Few years ago, there were campaigns and tournaments, but right now the days are more easy for both of major GW systems. Only casual, friendly games. 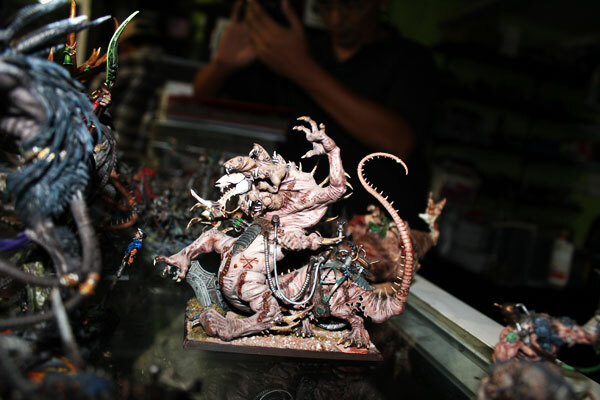 Pedro, owner of the store has armies of Orks – one for WHFB and other for WH40k. 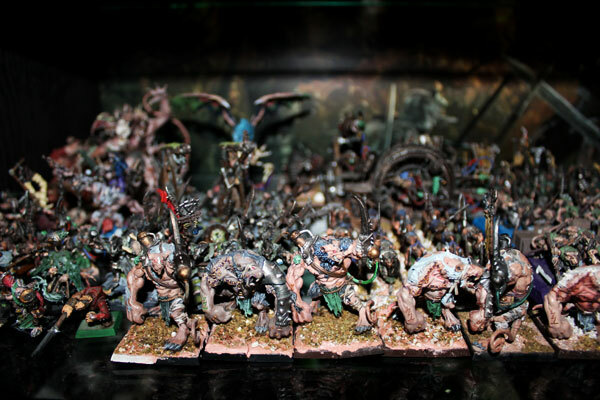 He doesn’t play very often these days – and lots of minis still unpainted, but he has some nice models. Take a look. 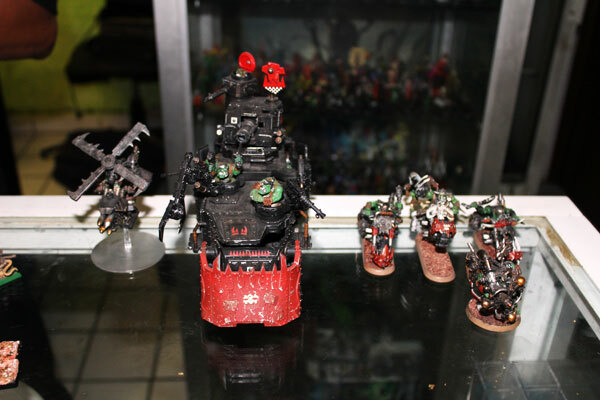 …and some Fantasy Orks too. Stormfiend. End Times is near! 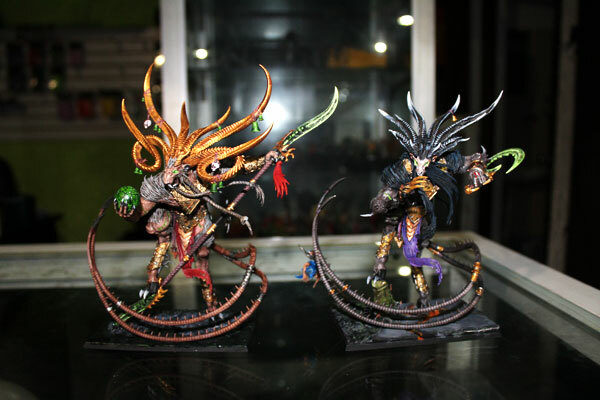 Verminlord Warpseer and Verminlord Deceiver. 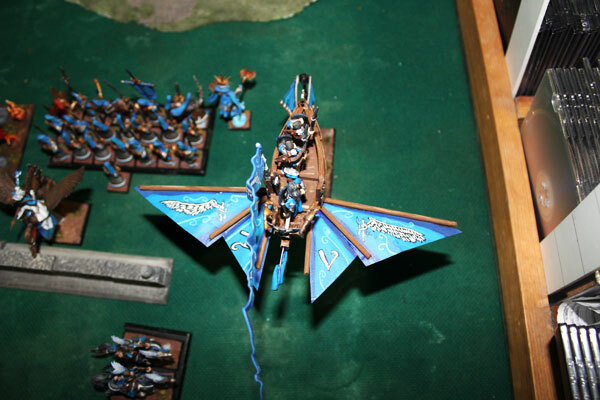 The third guy I met – Miguel, plays High Elves. His army is also at the display at the store, so it’s easy for him to play whenever he wants. All painted and prepared for battle. 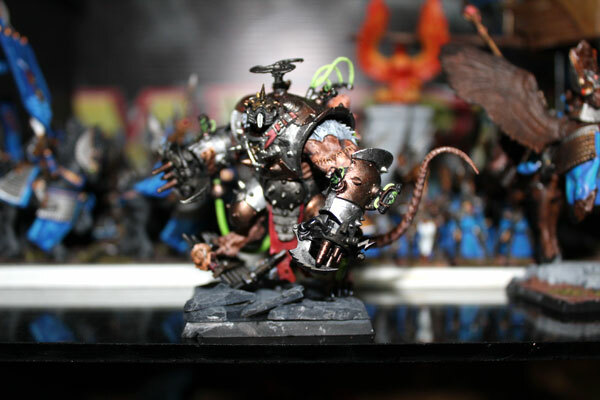 He is playing Warhammer Fantasy Battle for 9 years and he’s is one of the most experienced players in the area. High Elves preparing to battle. Miguel and Jose have been so nice and helpful and they took off their armies from the cabinet and made this cool minis show off. High Elves vs Skaven. This could be epic battle! From the left: me, Miguel, Jose and Pedro. Thank you guys! Until next time! Hasta luego! Conclusion. 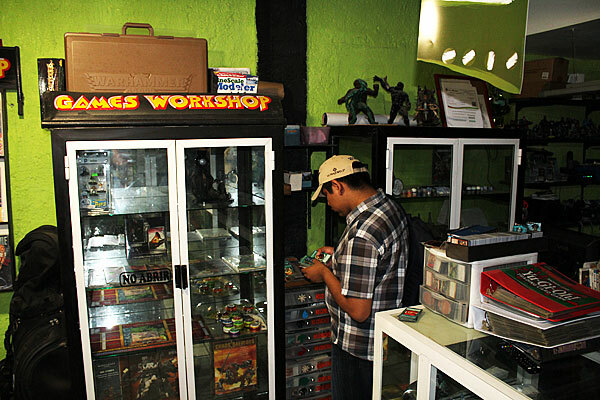 Gamers Den is small store, and do not offer many miniatures, but as hobby centre is nice. And important – as I think Cancún is popular tourist destination for lots of Americans and Europeans. 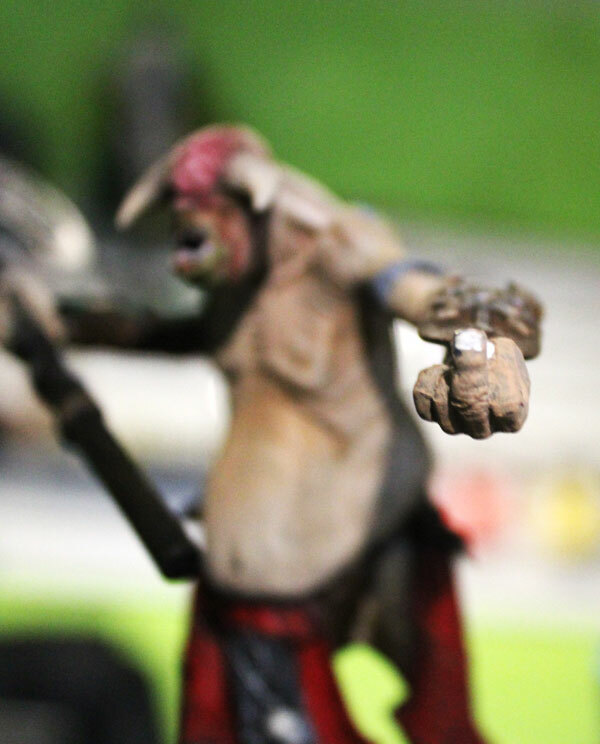 It’s cool idea to play even on holidays – just pack some miniatures and contact Pedro from Gamers Den. He can arrange the battle for you (sounds unusual and crazy, I know, but I’m actually thinking to take one for my next Australia/New Zealand/Asia trip. Not sure what army though, will see). Or maybe cards – cards are easy to pack, and Cancún is card place. World wanderer, miniatures collector and painter. Next PostLady Ellendeanne from Wolsung Skrimish Game ready!